MOLLUSCA : NUDIBRANCHIA : Eubranchidae SNAILS, SLUGS, ETC. Description: Variable in colour with four distinct morphs. The normal morph encountered is translucent white with scattered yellow/orange patches on its dorsum and on the tips of the cerata, rhinophores and oral tentacles. The translucent white skin can be replaced by a purple-black or tawny orange/golden hue. An all-white form with the orange pigment replaced by white is common. All forms mentioned have been observed mating with each other, and their internal anatomy is apparently identical. The results of recent genetic analysis of the four morphs support the opinion that they are all one species. Mature specimens of Eubranchus farrani grow to 20mm in length. Habitat: Usually found in the shallow subtidal, it feeds upon Obelia geniculata on kelp fronds and also on other species of Obelia and on Aglaophenia pluma. The spawn is a ribbon laid in a spiral of about two turns, flared out on its upper margin. Distribution: Found all around the British Isles and from Norway to the Mediterranean. 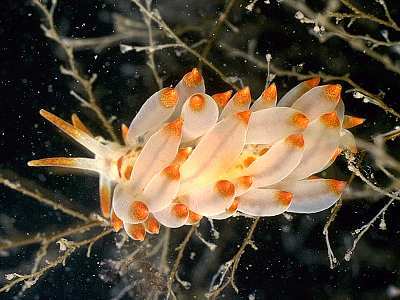 Similar Species: The white morph with yellow tipped cerata and tentacles is the form most likely to be confused with Eubranchus tricolor, however E. farrani may be easily distinguished by the presence of yellow pigment on the rhinophores, oral tentacles and dorsum. Swollen cerata with yellow or white bands of pigment at the tip. Pigment spots usually on body but never on cerata. Picton, B.E. & Morrow, C.C. (2016). Eubranchus farrani (Alder & Hancock, 1844). [In] Encyclopedia of Marine Life of Britain and Ireland.